Coming to you from AirVuz headquarters in Minneapolis, MN, Angie Avestruz updates you on what’s happening in the World of Drones. An incredible aerial hyperlapse of Hong Kong was uploaded to AirVuz.com over the weekend by content creator Majestic. If you want to see more amazing drone views of Hong Kong check out our entire collection which is linked in the description. UPS announced last week that it is working with UAV startup Matternet to use drones to deliver medical supplies to a hospital in North Carolina. Stay tuned to AirVuz News for an interview with Matternet’s founder and CEO. The University of Zurich has created a drone that flies using artificial intelligence. At the International Conference on Intelligent Robots and Systems it was able to navigate through a complicated race course, the only catch… its top speed was 5.6 miles per hour. New Pentagon documents show that the U.S. Defense Department plans to cut back its investment in drones. Budget analysts believe this is because of Trump’s administration’s intention to withdraw from wars in the Middle East. Facebook has cancelled its plan to create a fleet of bird-sized drones carrying data. The project called “Catalina was meant to improve wireless speeds to communities with slow internet connections. AirVuz’s Tyler Mason chatted with Dale Cochrane, the director of aerial cinematography company, RavenAir on the Drone Dish. You can find the link to that episode in the description. Don’t forget the winner of the Drone Video of the Week contest will be announced tomorrow. Tune in to see who is walking away with $250 based on your votes. That will do it for this week’s World of Drone’s, we’ll see you next week! Hawkins, Andrew J. “UPS Will Use Drones to Deliver Medical Supplies in North Carolina.” The Verge, The Verge, 26 Mar. 2019, www.theverge.com/2019/3/26/18282291/ups-drone-delivery-hospital-nc-matternet. Swearingen, Jake. “A.I. Is Flying Drones (Very, Very Slowly).” The New York Times, The New York Times, 26 Mar. 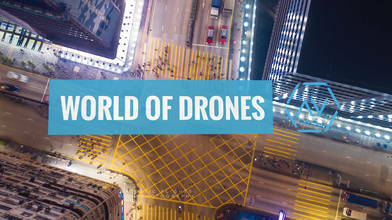 2019, www.nytimes.com/2019/03/26/technology/alphapilot-ai-drone-racing.html. “The Decline of the Drone.” U.S. News & World Report, U.S. News & World Report, www.usnews.com/news/the-report/articles/2019-03-29/us-military-turns-away-from-drones. McKay, Tom. “Facebook Scraps Plans to Build Its Own Massive Internet Drones for Its Aquila Project.” Gizmodo, Gizmodo, 27 June 2018, gizmodo.com/facebook-scraps-plans-to-build-its-own-massive-internet-1827158574.